NASA's newest Earth-watching satellite is beaming back spectacular views of our home planet – huge mosaics of many images stitched together at the highest-resolution yet obtained. But there's a bit of science mojo at work to create the stunning photos. 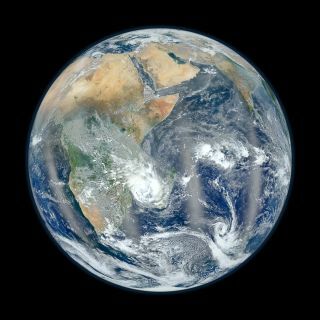 The new Earth photos, which NASA scientists have dubbed "Blue Marble" views, come from the Suomi National Polar-orbiting Partnership (NPP) satellite. The minivan-size spacecraft is the first of its kind: an Earth-observing satellite built to collect data for both short-term weather forecasts and long-term climate models. The latest photo was released Thursday (Feb. 2) and shows the sharpest view yet of the Eastern Hemisphere as it appeared on Jan. 23. The continent of Africa dominates the view, with the Middle East and Asia stretching up toward the top of the frame. In the image, the Earth is striped by four huge vertical lines created by sunlight reflecting off the ocean. It follows on the heels of NPP's portrait of the Western Hemisphere, which NASA's Goddard Space Flight Center released last week and has been viewed 3.1 million times on the center's Flickr photo-sharing website. The Suomi NPP satellite photographs the Earth from about 512 miles (824 kilometers) in a polar orbit (a path that passes over the North and South Poles). While that orbit seems high, it is still not high enough to fit the entire Earth in a single camera frame. For example, Suomi NPP's BlueMarble photos show the Earth as it would appear to an observer perched about 7,918 miles (12,743 km) away. So to make the whole-Earth images, NASA scientist Norman Kuring combined Suomi NPP observations of the same parts of the planet taken over six different orbits, or passes, over the terrain during an eight-hour period. Kuring then stitched the data into a complete mosaic, creating one huge image of Earth. NASA scientists created the two new 'Blue Marble' images from data acquired by a new instrument that's aboard the Earth-observing satellite Suomi NPP, the Visible Infrared Imaging Radiometer Suite (VIIRS). The Suomi NPP satellite beams about 4 terabytes of data to Earth every day, mission scientists have said. That's enough photos of Earth to fill 800 DVDs. The extreme clarity of the Blue Marble photos comes from Suomi NPP's Visible Infrared Radiometer Imaging Suite (VIIRS), which is a high-resolution sensor package designed to observe Earth in different ranges of the light spectrum. As the satellite orbits Earth, it snaps photos over a strip of the planet about 1,865 miles (3,001 km) wide. The VIIRS instrument is the biggest and most important tool of the five instruments riding aboard the Suomi NPP satellite, mission scientists have said. It is designed to measure ocean color, surface temperature, fires on Earth, cloud distribution and the amount of particles called aerosols in the atmosphere. The Suomi NPP satellite is named after the late meteorologist Verner E. Suomi, who has been hailed as the father figure of satellite meteorology. The spacecraft is expected to observe the Earth through at least 2016. The mission is conducted under a partnership between NASA, the National Oceanic and Atmospheric Administration and the U.S. Department of Defense.